Respected President Com. Balbir Singh, CITU General Secretary Com. 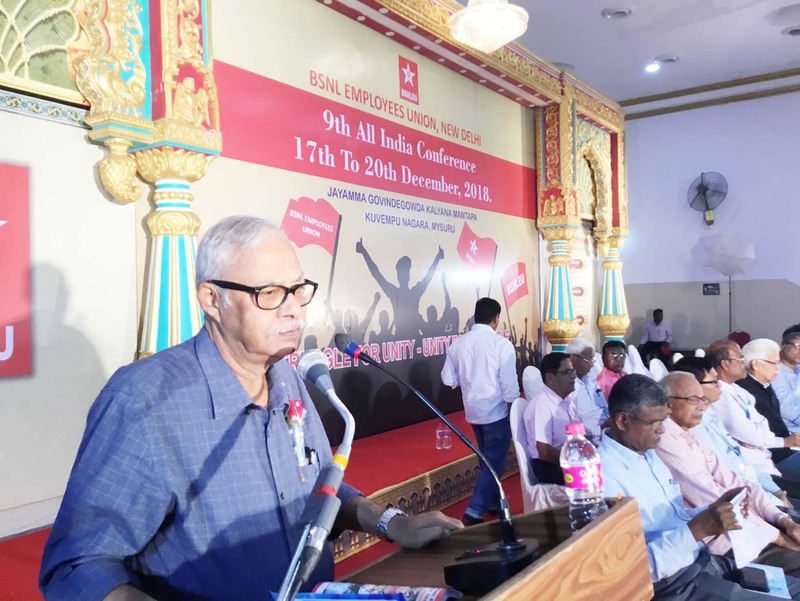 Tapan Sen, who inaugurated this Conference, Comrade Amanulla Khan, President AIIEA, Comrade P.Abhimanyu, General Secretary, BSNLEU, Com.K.G.Jayaraj, General Secretary, AIBDPA, Com. Seethalakshmi, General Secretary, P IV Union, Com. Umesh, General Secretary, CITU Karnataka, Com. Animesh Mitra, Secretary General, BSNLCCWF, Com. Mahantesh, Circle Secretary BSNLCWF Karnataka,Com. Swapan Chakraborty, Dy. General Secretary, Gokul Borah, Treasurer, C.K.Gundanna, General Convener, Reception Committee, Com. H.V.Sudarshan, Asst. General Secretary, BSNLEU, Com. M.C.Balakrishna, Circle President BSNLEU Karnataka, Com. G.D.Patil, veteran leader AIBDPA, Com. Muddiah, Circle Secretary, AIBDPA, Karnataka, Com.B.P.Narayana, former Circle President BSNLEU, Com. Balajai, senior leader CITU, other distinguished leaders who are present, leaders of the of the Reception Committee, all the delegates who have come from all parts of the country, visitors and well-wishers! Dear Comrades and Friends, My Warm Greetings to all of you who are present here in this All India Conference! First of all, I thank Com. P.Abhimanyu, General Secretary BSNLEU and Com. C.K.Gundanna, General Secretary Reception Committee, for the kind invitation to me to attend and address this august IX All India Conference of BSNLEU, being held in this great and ancient city of Mysuru, the cleanest city in the country. It is also the cultural centre of the Karnataka state with its great cultural tradition, where centuries back, Shri Basavanna preached for communal harmony and removal of caste discrimination. BSNL is 18 years old and BSNLEU 17 years. 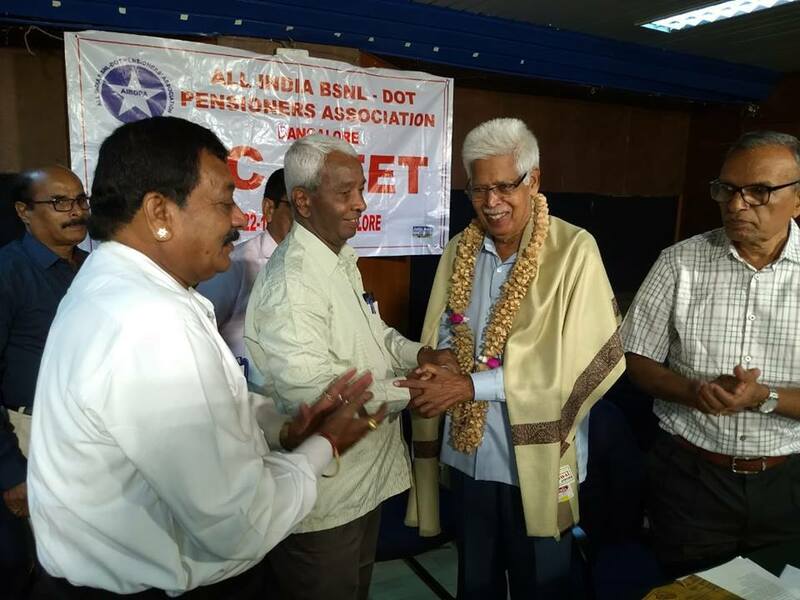 Both are part of the heritage – BSNL that of P and T Department and BSNLEU, that of NFPTE, the great united organisation of the P and T workers. We always cherish this memory. Both the UPA and NDA governments in furtherance of their anti-PSU and anti-people policy have conspired to close, disinvest BSNL, unbundle the copper cables, impose VRS, formation of tower company bifurcating BSNL etc. etc., but the united and sustained struggles organised by the Forum/Joint Forum, AUAB etc. with the initiative of BSNLEU have thwarted all these attacks and defended and saved BSNL. Now the latest challenge before the workers is the settlement of the Wage Revision due from 01-01-2017, Pension Revision, 30% pension benefits for the BSNL recruited employees to whom the statutory defined pension is denied, reducing the pension contribution based on the actual pay instead of the maximum pay etc. The question of allotment of 4G Spectrum, which is essential for providing the latest efficient services, is also a major demand. You can be proud that the sustained agitational programme and the notice for Indefinite Strike from 3rd December 2018 and the full preparation for the same compelled the Communications Minister to meet the AUAB, discuss the issues on the basis of which the indefinite strike has now been deferred. Promises are to be kept. But this is a government which did not honour its assurances and promises made either at the time of election or afterwards. Hence continued pressure is required for achievement of the demands. The young recruits, who are highly qualified, have their own aims and objectives to improve their status and financial position. This has to be taken care of. The agreement to increase the pensionary benefits now to 26% and later to the full 30% is a great achievement. Wage Revision and Pension Revision are very important demands. Some assurances have been received on delinking of pension and pension revision. The Pension revision should be granted with 15% fitment as recommended by the III PRC. No such assurance is given on wage revision. The wage revision is of prime importance, the workers are impatient and the AUAB has to continue its efforts in the matter. In fact, today 17th December is the “Pensioners’ Day” being observed in memory of the historic Supreme Court judgment in Nakara case, which upholded and declared that pension is a right and not any charity. About one lakh casual contract workers engaged in BSNL are cruelly exploited, Minimum wage is not paid and social security benefits are not implemented in many circles. The issues are under discussion with the CLC, management etc. In fact local struggles are going in many circles. The exploitation of the casual labour In Varanasi and E.UP from where Prime Minister Modi was elected was brought to the notice of the Prime Minister himself, but nothing changed. The exploitation continues. BSNLEU should give all support and solidarity to the struggles of the Casual and Contract workers. The last four and half years of the BJP government have brought more and more misery to the common people. The demonetisation, GST, denial of trade union rights, non-implementation of election promises including waiver of loans of Kisans and 150% minimum support price to the farmers, brutal intervention in the functioning of autonomous institutions like CBI, CVC, RBI etc. creating almost constitutional crises, undue favouring to the corporate houses, non-action against NPAs – the system is being collapsed. We have got a Prime Minister, who attended Parliament only 17 days during the last four and half years, with more time spent on foreign visits to about 80 countries costing the exchequer about 2000 crores as per paper reports. Corruption cases, including Rafael, are being exposed. Communal harmony is being threatened. The GDP increase has been very slow. The central government employees and pensioners are on struggle for wage and pension benefits. The Option 1 recommended by the VII CPC is not implemented. Pension is under attack. One Rank, One Pension is not implemented except in Defence. Another demand is that the PFRDA should be annulled and that the old system of pension ie. Defined Statutory Pension is to be restored for the new recruits. The Central Trade Unions, in continuation of the sustained struggle have called upon the workers to organise 2days strike on 8-9 January on the major demands of the working class. BSNLEU had always joined these struggle in the past years. This time also BSNLEU has decided to be part of this great struggle. The support and solidarity and donations given by the entire country at the time of the unprecedented floods and landslides in Kerala in which 413 precious lives were lost are remembered with thanks by the people of the state. The government and the people are trying to build up a new Kerala better than that existed. The Kerala LDF government stands for equal status to the women in all spheres and is committed to implement the Supreme Court order against restricting of entry of women in to the temple. The government is making all efforts to make the Sabarimala a place of peaceful worship, despite the violence and rowdyism of the RSS goondas. Though I am not technically part of of BSNLEU at present, the bond with it continues. It is a strong bond which will continue for ever. I can assure you that I will always be with you in your struggles and achievements. I am sure that BSNLEU, you comrades, will always be in the forefront of the struggles of the working class. The most important duty of a trade union is to fight for the rights and demands of its members. Second is its progressive outlook and working class character. Third is the urge for the working class unity and connection with sister unions, central trade unions and the International working class. BSNLEU has been continuing on the correct line on all these. I congratulate the leaders and workers for the same. Struggle for Unity, Unity for Struggle! I may add one more : Unity and Struggle for Progress! Revolutionary Greetings to all of you! Lal Salam Comrades!